If new technology is at the heart of getting ahead in business, the U.S. is about to hit a competitive bump in the road. US jingoists and believers in general "exceptionalism" should take note that the country is setting itself up for global economic failure. Not that there's a "going out of business" sign hanging on entry ports. However, there's a trend that is going to be a serious problem in the future -- one that will put the U.S. behind a number of up-and-comers. 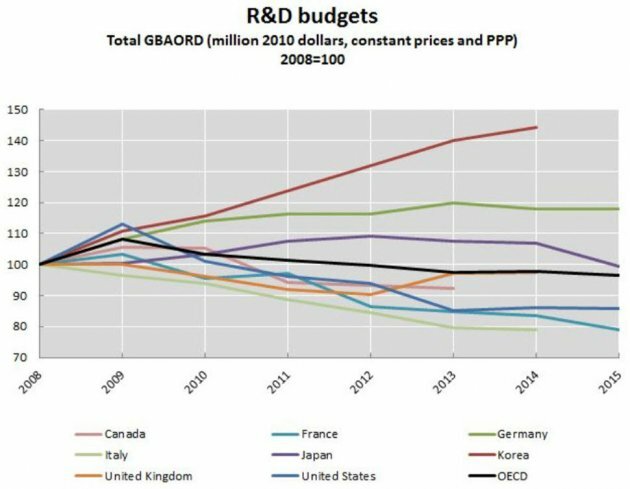 Provisional data for 2015 indicates that public R&D budgets in the OECD area continued their downward trend since 2010 after briefly stabilising in 2014. Among countries for which 2015 data are available, two thirds have decreased their R&D budgets in real terms and the estimated area total has dropped by 1.3%. In a number of cases, this decline may have been mitigated through growing support through R&D tax incentives, which have been increasing in relative importance over time. On the basis of leading budget data, it is expected that R&D performed in government and higher education institutions in the OECD also declined in 2015. Like many other countries, the US is putting less and less publicly into R&D, and public funds have been a traditional support of the basic science and development whose scope is beyond the capabilities of individual corporations. But notice that South Korea is rocketing ahead. According to the data, China continues to grow R&D, albeit at a slower rate given macroeconomic challenges, but still 9 percent in real terms. Israel's R&D is at 4.1 percent of the country's GDP, while Korea is at 4.3 percent. Some countries understand the connection between today's R&D investment and tomorrow's economic success. Many more may say they do but act differently. And the US is in that group. Maybe that's why so much research is being sent overseas these days -- and why kids might think about learning Chinese, Korean, or Hebrew rather than Spanish, French, or German.